This soup is so easy to make and so-o-o-o-o delicious. Mussels are an inexpensive yet nutrient rich seafood. 1. Heat oil in heavy soup pot or cast iron pot. 2. Slice onions and add to pan. Heat until translucent. 3. Slice and add garlic. Saute for a few minutes. 4. Add mushrooms and cook another 2 minutes. 6. Add wine and cook for 20 minutes. 7. Add the can of plum tomatoes roughly breaking up the tomatoes with your hands or a spoon. Add the bottled clam juice and canned clams. Bring to a boil. Add the basil leaves along with the chopped parsley. 8. Add the mussels which have been rinsed, debearded and the opened ones discarded. Cover and cook for 3 minutes until all the mussels have opened. 9. If any of the mussels will not open discard them. Serve “Mussel Soup Supreme” with garlic bread. FOOD TIP: When your raw mussels are open, tap them on a hard counter. If they do not close then discard them as they are dead and can make you sick. If they close then they are fine to cook and enjoy. I have tried using other sausages like hot Italian sausage but the soup is not as good in my opinion. 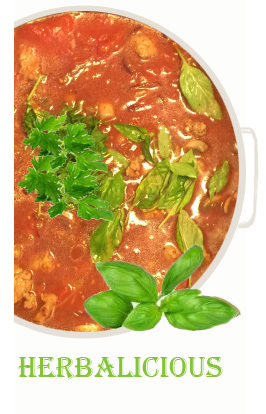 The mild Italian sausage give the pleasant mild fennel flavour to the soup. 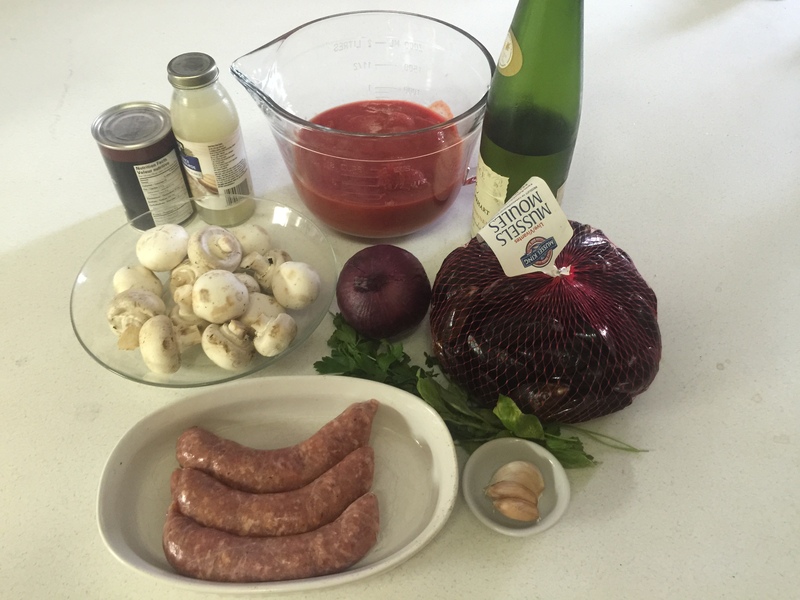 Adding sausage to this soup is very important to the overall flavour. DO NOT SKIP! You will see, and you will want a second helping! The sausages and the clam + clam juice is the supreme in this Mussel Soup Supreme. VARIATIONS You can add lobster, shrimps, scallops or any other seafood you have on hand to make this into a seafood soup. If you are adding raw lobster to the soup then add that first as it takes longer to cook. It will turn pink and then add any shrimp or scallops last since they require only a few minutes of cooking or they will become tough and rubbery. If you add canned lobster include the liquid from the can for more flavour. You can add almost any fish except salmon. It has too much of a strong flavour for this dish. Sherry can also be added while you are cooking these last bits of seafood. Sherry complements the flavour of the seafood.. . . MAINLY BECAUSE OF THE MEAT! 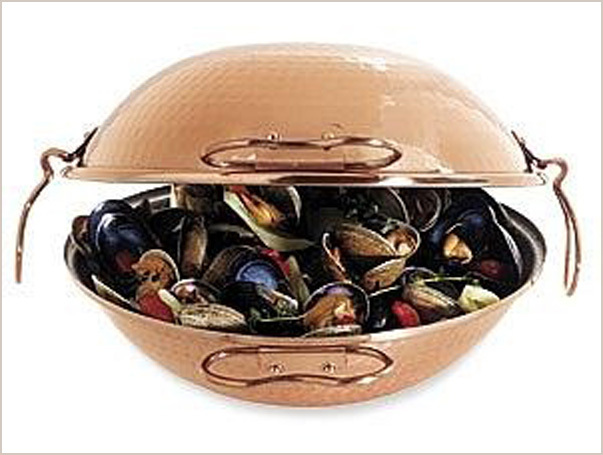 For decades the Portuguese classically make dishes which combine mussels and pork in their beautiful copper cataplanas. The pork adds that special something extra to seafood. It is the secret ingredient! It is absolutely delicious! Mussels are a rich source of many essential vitamins and minerals, such as the B vitamins, vitamin C, folate, iron, phosphorus, manganese, selenium and zinc. They outshine most other foods when it comes to their vitamin B-12, selenium and manganese content. A 3 ounce portion of moist-heat cooked blue mussels provides 20.4 micrograms of vitamin B-12, meeting 340 percent of the recommended daily value for this nutrient, according to NutrientFacts.com. Vitamin B-12 is essential for a healthy nervous system, the formation of red blood cells and proper growth and development. The same amount meets 108 percent of the DV for selenium and 288 percent for manganese. Selenium is important for immune system function and supports the thyroid gland, while manganese is involved in bone health and energy metabolism. 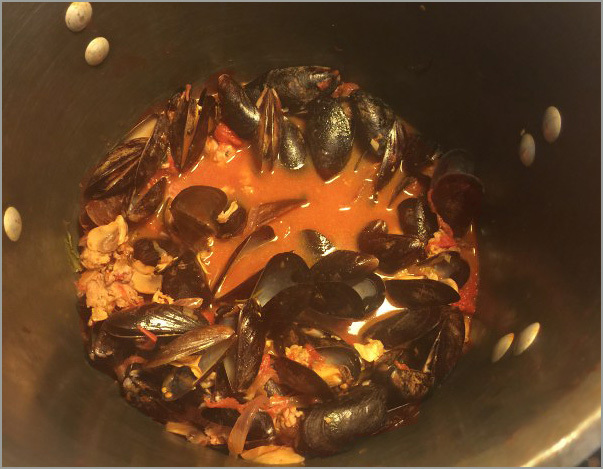 Mussels are rich in sodium as well which is why this soup did not need any salt added. Yes, delicious, fresh, lively taste. Glad you liked it and healthy too! Thank you Eva. Now I can send this recipe to my friends! Every time I need to lose a few extra pounds I make this soup. It is so low in calories and I feel Like I am eating something sinfully good! A WIN!! WIN!!! situation. Yes, you are right. It is one of my favorites soups too. This recipe looks fabulous! I am a big seafood fan and I am always trying to get healthy recipes for the kids. I like the basil you have added. I’m going to make it this week! 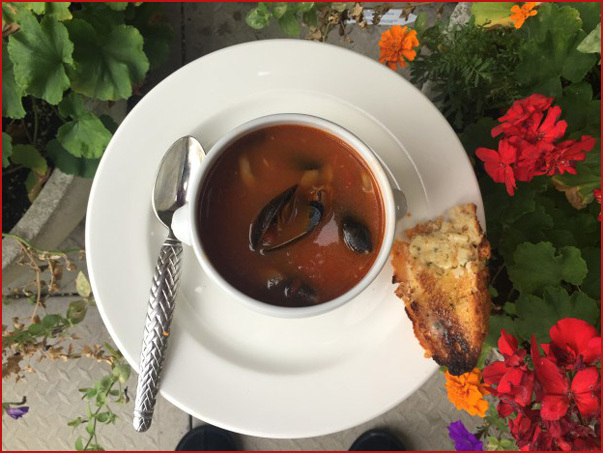 I have made the Mussel Soup Supreme twice and each time my guests have raved about it. One of the things that’s so great about this recipe is that you can do everything but add the mussels prior to your guests arriving. Love that. Fabulous! I’m so glad you enjoyed it! It is so easy to make and also freeze and reheat. I will sometimes add other seafood to it as well. Thank you so much for your feedback!